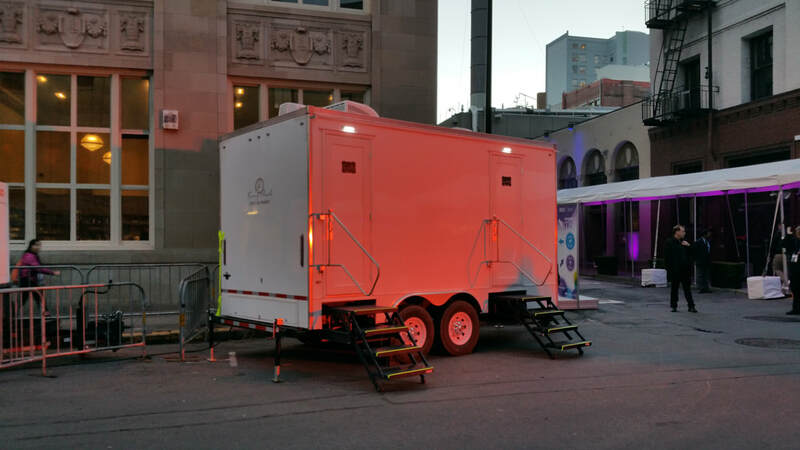 Flushing multi-stall comfort station trailer rentals used for weddings, corporate events, office remodels & VIP sections at special events. 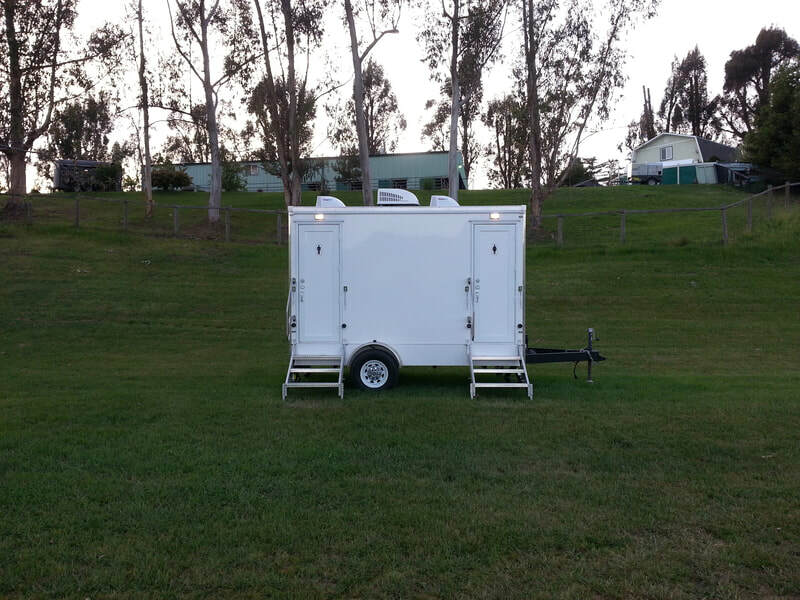 Rent the right restroom trailer for your Special Event or Job. The most important consideration when picking a executive restroom trailer is the amount of people who will be using the washrooms. For short term events you want to avoid lines, for long term or multi-day special events waste tank capacity becomes a concern. When in doubt play it safe and order the next larger size bathroom. 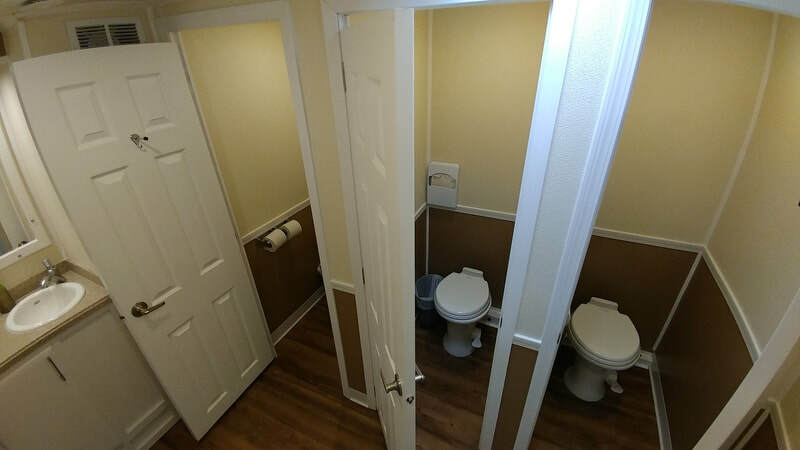 In general, we recommend a maximum guest count of 75 people per bathroom stall for events and to look at the flush rating for long term rentals. 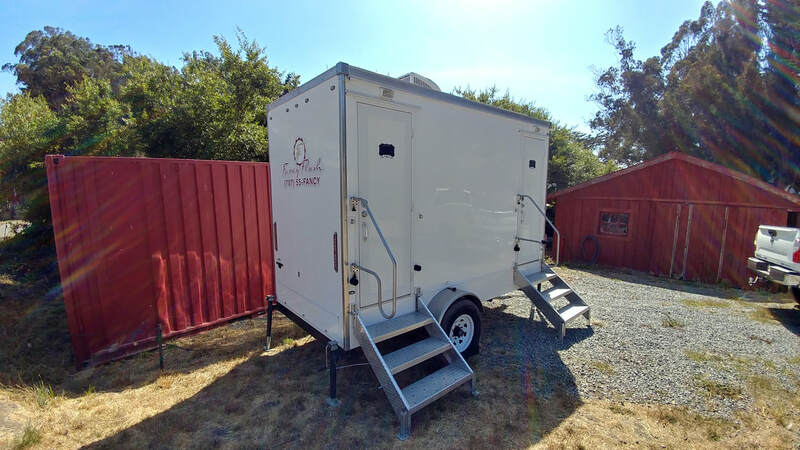 ​Small, agile & affordable, our standard 2 stall restroom trailer has all the basics from flushing toilets, hand wash sinks & more. 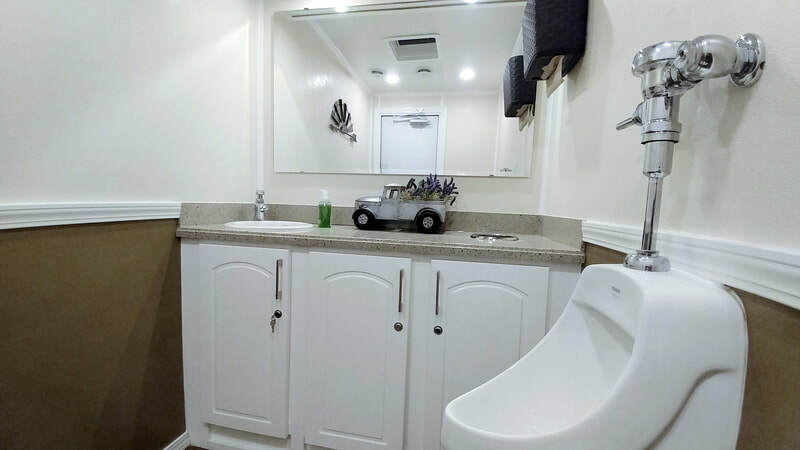 This 2 stall restroom trailer has the largest bathroom stalls, flushing toilets; luxurious features like A/C, music & elaborate decor. A fancy restroom trailer has 3 separate bathroom stalls, toilets that flush, climate control, hardwood floors etc. 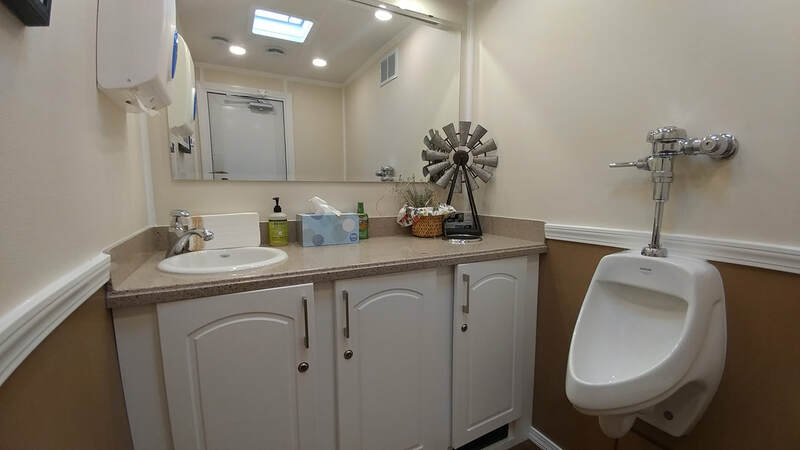 Featuring flushing toilets, air conditioning & vessel sinks, This restroom trailer has 2 elaborate suites with 2 stalls each. This restroom trailer has 2 posh suites with 2 & 3 stalls respectively, flushing toilets, climate control, decor & music. Restroom Trailer Accessories & Services. Designed to power the A/C & Heater of our LUX series restroom trailers. Keeps bathrooms clean, manages guests usage of the bathrooms (reduces lines). Manages restroom functions & problem solving. 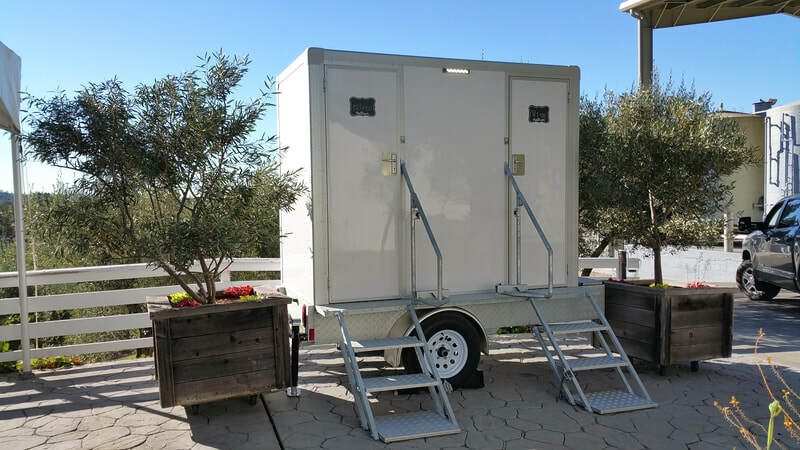 Our new VIP portable restroom trailer features a modern and clean interior. 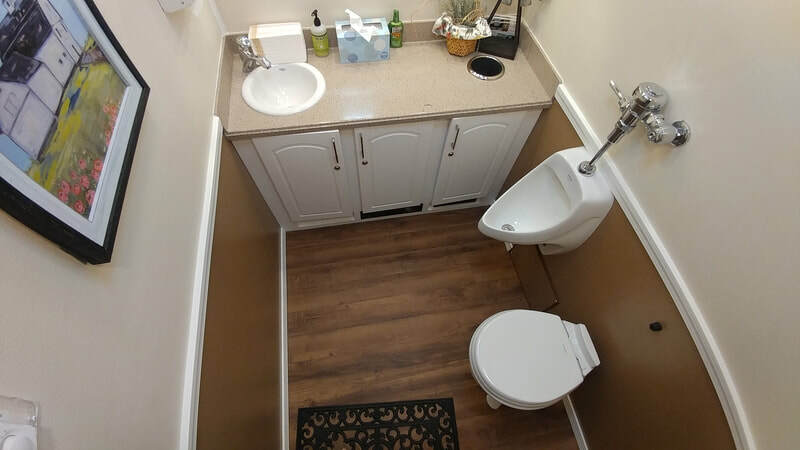 This restroom rental compares favorably to traditional VIP models, having a larger capacity waste and water tank, larger interior, exterior lighting and hard wood flooring. Extra perks include a window for ventilation, solar power, and a large counter top for knickknacks, yet is compact and able to be placed anywhere. Our fancy LUX executive restroom trailer will wow your guests with it's decorative interior. It's like the bathroom at a 4 or 5 star hotel and features luxurious trim, two tone paint, hardwood/tile floors, corian counter tops, decorative pictures, flowers & porcelain fixtures. This restroom is ideal for larger events year around due to its climate control and for events with access to power (a generator can also be rented). 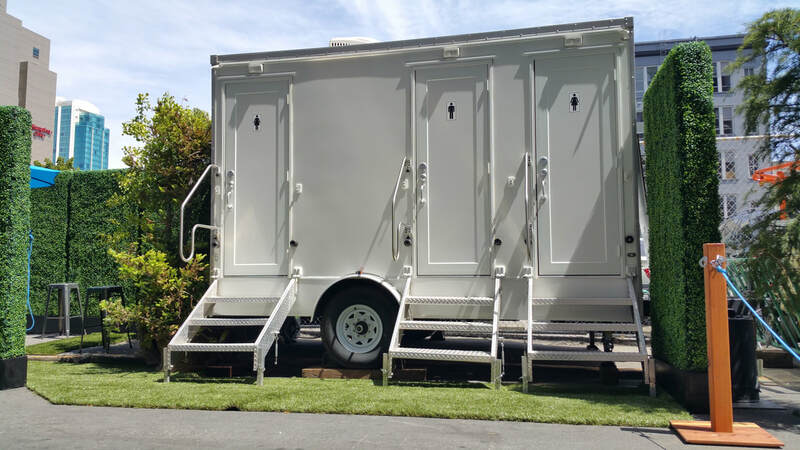 This luxurious restroom trailer may have your guests spending more time inside the bathroom than at the party. This restroom is ideal for Weddings, Birthdays, Graduations, Funerals, Receptions, Corporate Events, and more. Our fancy LUX executive restroom trailer will wow your guests with it's decorative interior. It's like the bathroom at a 4 star hotel and features luxurious trim, two tone paint, hardwood floors, corian counter tops, decorative pictures, flowers & porcelain fixtures. This restroom is ideal for larger events year around due to its climate control and for events with access to power (a generator can also be rented). 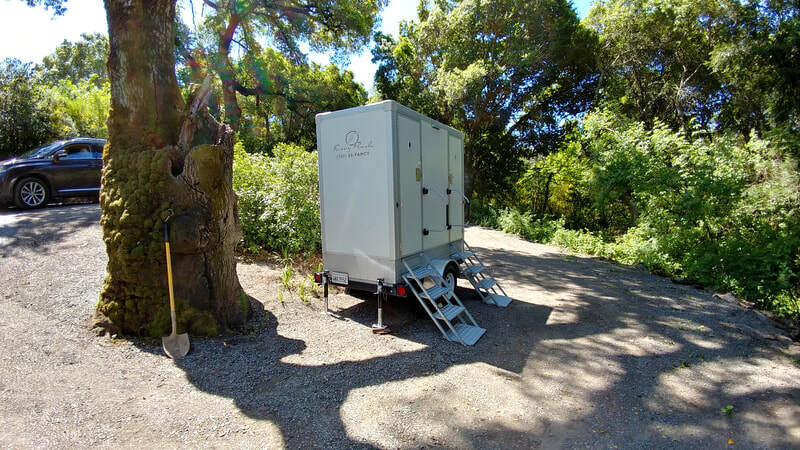 This luxurious restroom trailer may have your guests spending more time inside the bathroom than at the party. This restroom is ideal for Weddings, Birthdays, Graduations, Funerals, Receptions, Corporate Events, and more. Our fancy LUX executive restroom trailer will wow your guests with it's decorative interior. It's like the bathroom at a 4 star hotel and features luxurious trim, two tone walls, hardwood floors, corian counter tops, decorative pictures, flowers & porcelain fixtures. This restroom is ideal for larger events year around due to its climate control and for events with access to power (a generator can also be rented). 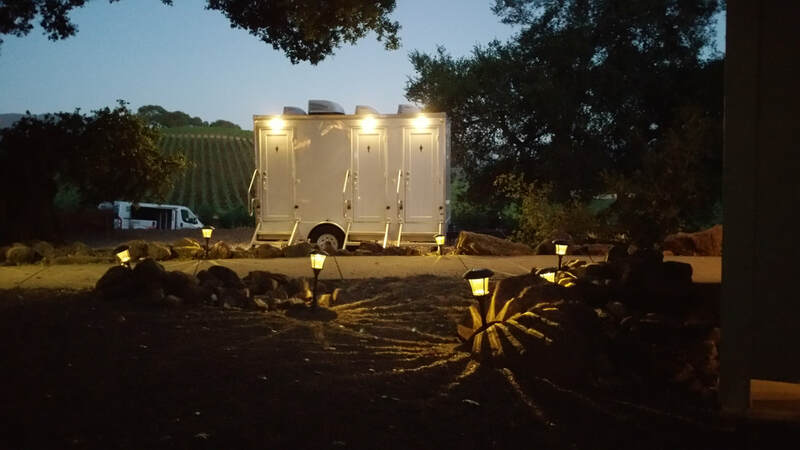 This luxurious restroom trailer may have your guests spending more time inside the bathroom than at the party. This restroom is ideal for Weddings, Birthdays, Graduations, Funerals, Receptions, Corporate Events, and more. 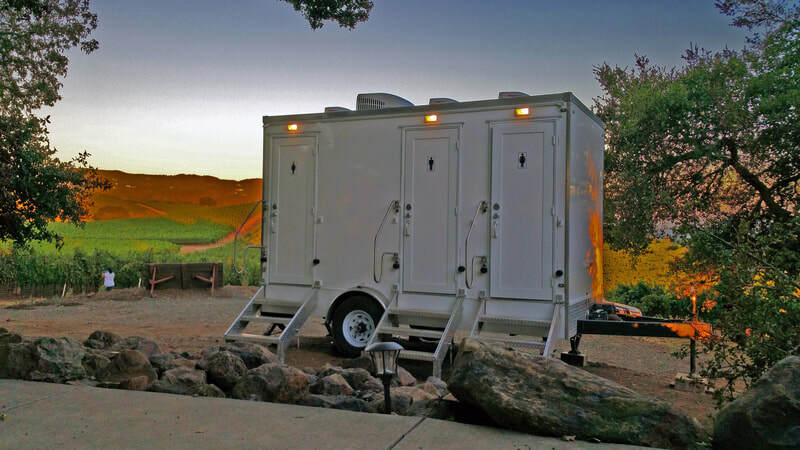 What makes a luxury restroom trailer different than a portable toilet rental? When considering a bathroom rental for your needs it's important to understand the differences, limitations or advantages of each type of bathroom rental. 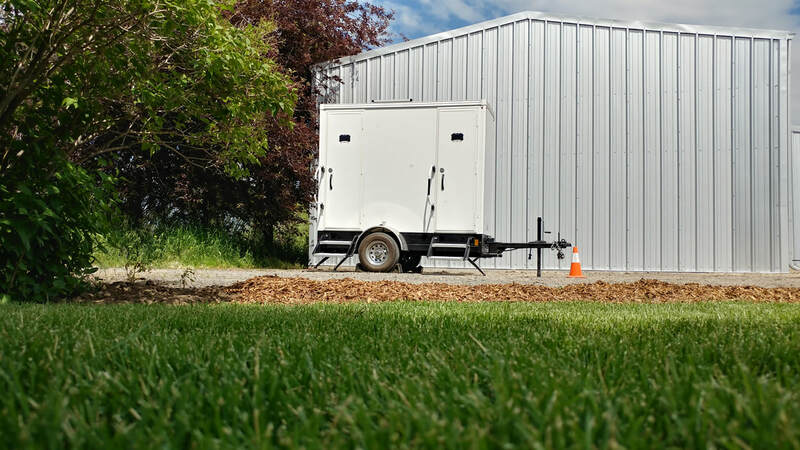 An obvious difference between a porta potty and a restroom trailer is in how each are constructed. A portable toilet is typically made from HDPE plastic while a restroom trailer is made with more traditional construction, like a home or RV. 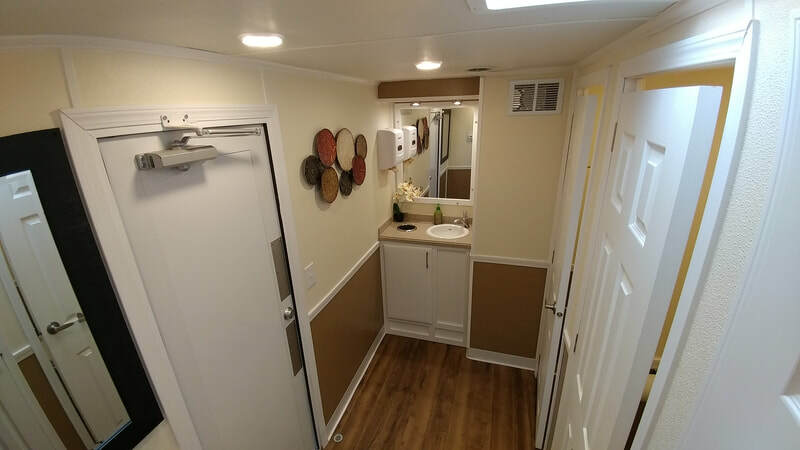 Restroom trailers typically are much nicer, larger inside and smell nicer than a porta potty. However, a porta potty is very inexpensive to rent making them ideal for long term rentals or areas with high risk of damage. 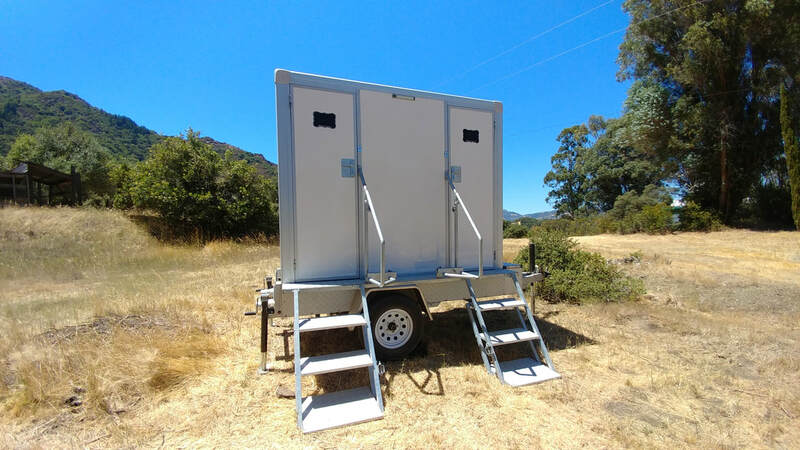 Though most would agree that they'd rather use a luxury restroom trailer, both a portable toilet and comfort station have ideal roles depending on where you use them. Listed below are examples of where/when each type of bathroom (portable toilet or restroom trailer) are more appropriate. 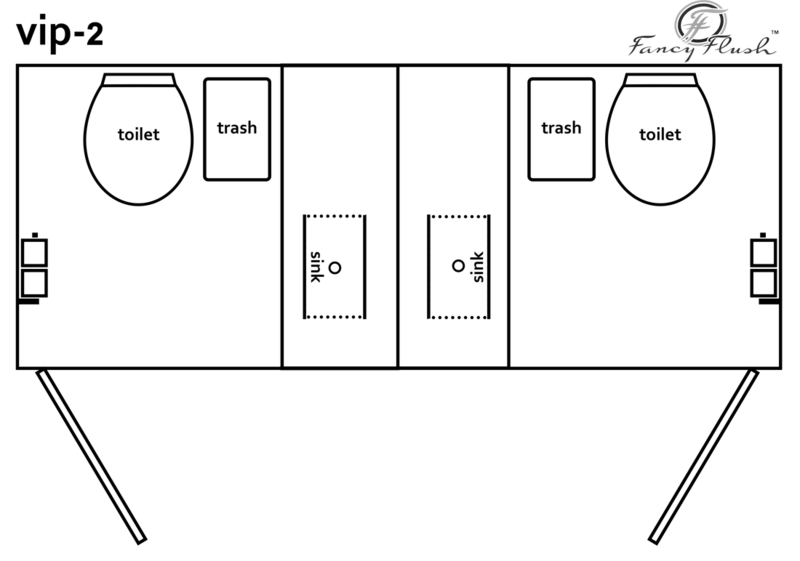 ​Ideal for upscale private events & locations with low risk of damage/vandalism. 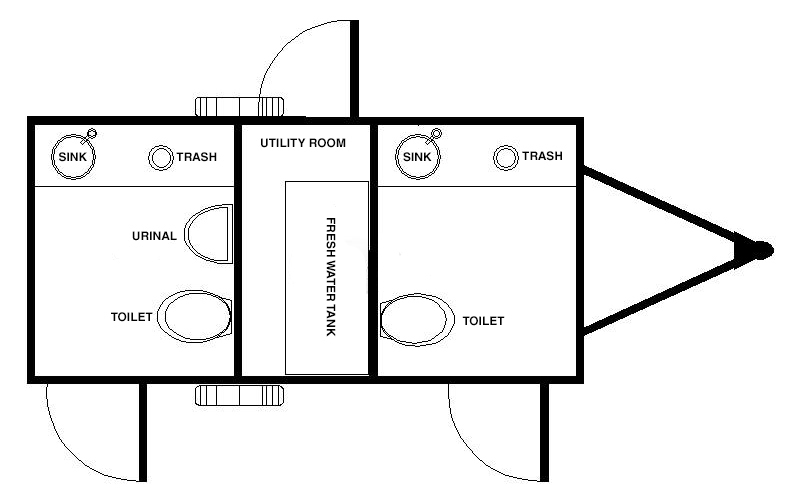 Ordering a restroom trailer through Fancy Flush is a very easy & simple process. Once we have your order, we'll drop off the trailer at the location & date you specify (we also accept GPS coordinates in lieu of an address). We will call you once we're on our way and when we arrive we level and set up the trailer. 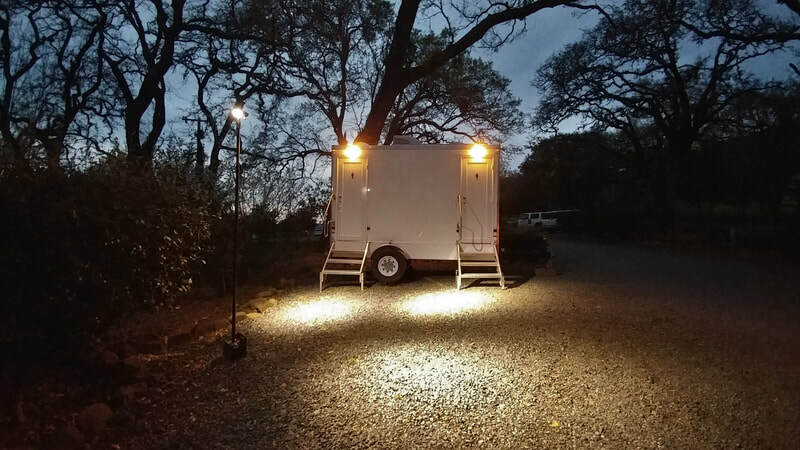 If your trailer needs power to run, we'll hook up your extension cord to our trailer or deploy a generator. 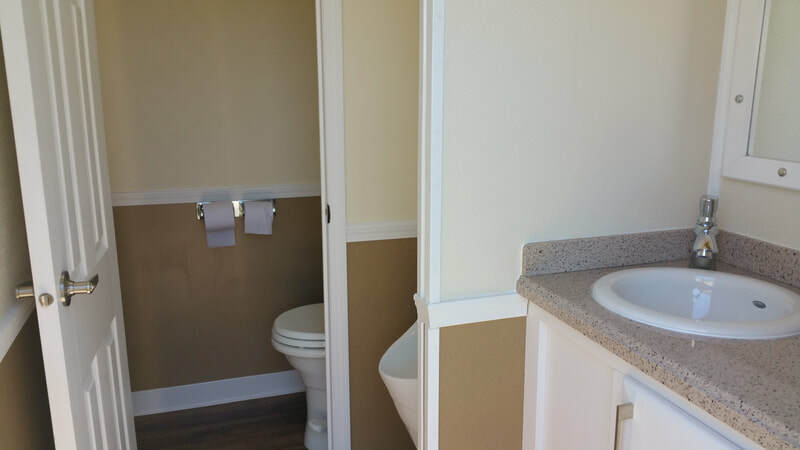 Our Restroom Trailers come fully furnished with water, soap, paper towels & toilet paper. Remember to keep the driving path clear of branches or other objects that may damage/scratch our restroom trailers. We require 12ft height clearance. 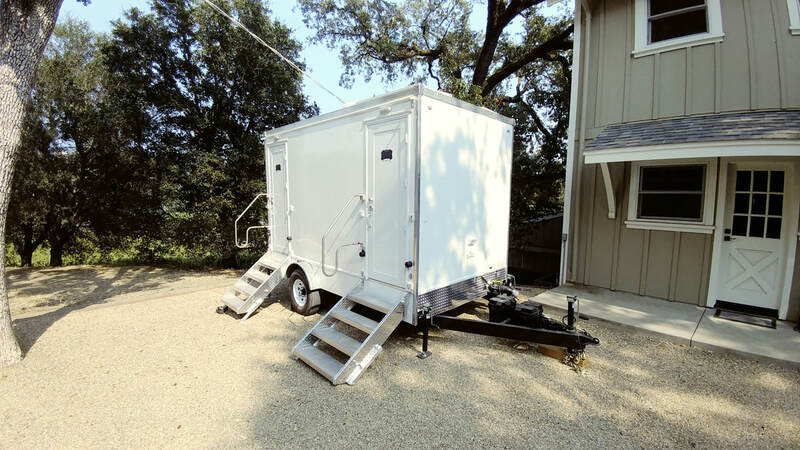 Some of our restroom trailers need external power to operate features such as climate control and water heater (if equipped). You can choose to rent our generator or plug into your power source.